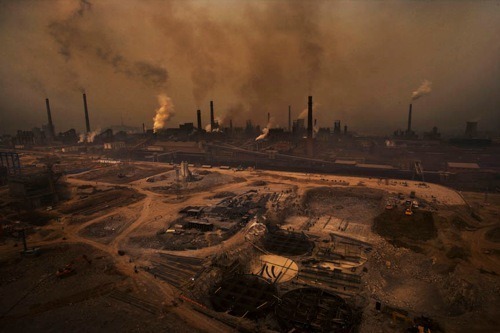 Chinese environmental photographer Lu Guang won the 2009 W. Eugene Smith grant in humanistic photography for his for his project, “Pollution in China.” (For more information and photos see NYTime’s Lens blog , and China Hush). Some of his arresting images show plumes of pitch black and garishly colored yellow and red smoke belching out of factory and power plant chimneys – almost all caused by the burning of soft coal. They are reminiscent of the eerie, unnatural images and colors that blink out of a television set when the tint controls are turned all the way to one side. His pictures of open-pit coal mines that have been illegally gouged into the Mongolian steppe, and the attendant mountains of tailings that tower beside them, bespeak a landscape so despoiled that millions of years of restoration will not be enough to heal it. Everything you see in Lu’s photographs—whether desolate mines, gritty plants spewing out toxic smoke, grimy miners, poisoned bodies of water or tundras of trash—grows out of China’s use of coal. In fact, 80 percent of China’s electricity comes from coal (in contrast to about 50 percent for the US). And electrical power has provided the Chinese economy with the energy it needs to maintain 10 percent growth rates for more than a decade. In other words, coal has been China’s bounty and salvation, enabling tens of millions of people to rise up from grinding poverty, and allowing the government to build a whole new system of ports, highways, airports, railroads, bridges, buildings, and tunnels. It has also helped to create a prosperous middle class; and contributed to China’s emergence as a world power. However, China’s reliance on coal has been polluting the country’s air and water, depleting its resource base and despoiling its landscape in ways that are difficult to imagine without actually visiting the Chinese countryside. Yet the photography of Lu Guang gives us a glimpse of this landscape, reminding us that these scenes of devastation are not isolated phenomena. They are ubiquitous. Above all, it also reminds us that there is a steep cost to such rapacious and high-speed development, something the Chinese government has started to understand and to try and remedy.